In the first part of elite endurance runner Calum Neff’s self-coaching success story, we explored motivation with Calum as a self-coached athlete. Now, we’ll dig a little deeper into the topic as Calum shares his self-coaching tips, tricks, and technology favorites that can help any serious runner find their own success. Calum has run all his life. Under the expert direction of coaches, his early running years (through college) taught him a lot about the craft of building training workouts and schedules. After graduating, Calum used that knowledge as the foundation for becoming his own coach. He also augmented what he knew by taking advantage of many easily accessible running resources. That, and some experimentation, helped him gain traction on the world stage. “The advanced technologies available today put coaching-level analytics within easy reach of the self-coached athlete,” says Calum. Below, he shares the key tools for the self-coached runner that he uses and how he uses them for achieving even his most daunting running goals. As a teenager, I remember manually analyzing splits, graphs, max heart rate, and recovery times using the old Polar software. Now that has all been shifted online and into apps using Polar Flow. All that analysis is pretty much done for me and recorded and stored to compare year after year. 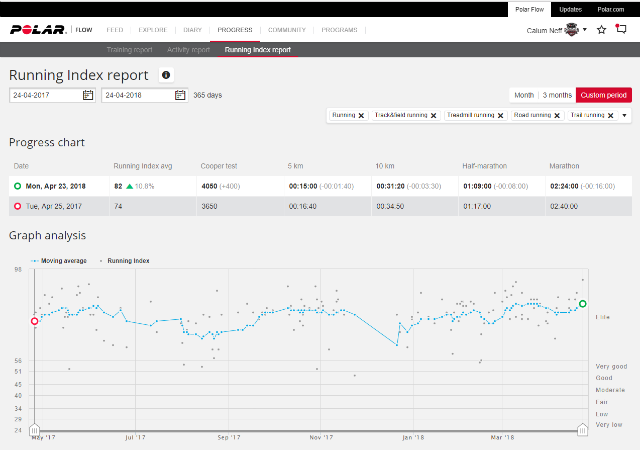 As a self-coached runner, Polar Flow makes it easy to see my weekly summaries, workout reports, and even a long-term trend of my fitness using an index report (similar to V02 max). While the couple hours of training each day is clearly important, “the other 22 hours” is where you can make the real gains. While the couple hours of training each day is clearly important, “the other 22 hours” is where you can make the real gains. Monitoring my recovery status, sleep quality, resting heart rate, weight (using the Polar Balance scale), and general daily activity is all part of living a balanced and optimized lifestyle. Since “time on the feet” is a huge part of ultra marathon training, it’s helpful that the daily activity logs steps and sends inactivity alerts to remind me to move while I’m at work. My tracking devices currently include the Polar M430 for my less regimented workouts while the Polar V800 is my workhorse with its reliably accurate GPS and HR data. One of the most difficult aspects of being your own coach is keeping track of where you are interval wise during a workout. 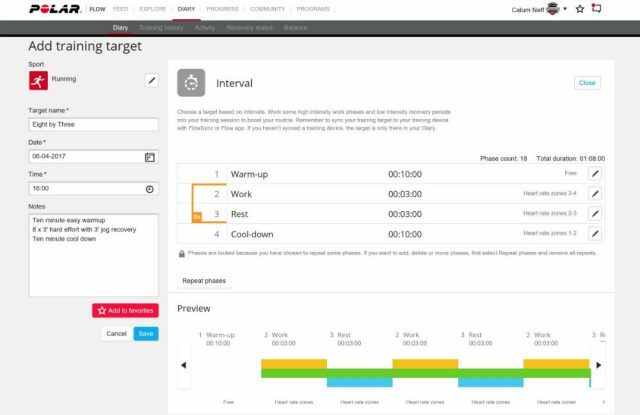 For some of my longer or trickier workouts with lots of repetitions or varying intervals, the custom Training Target feature of Polar Flow is the perfect coach. This is where you can get creative in programming your watch—from goal paces to detailed interval sessions. 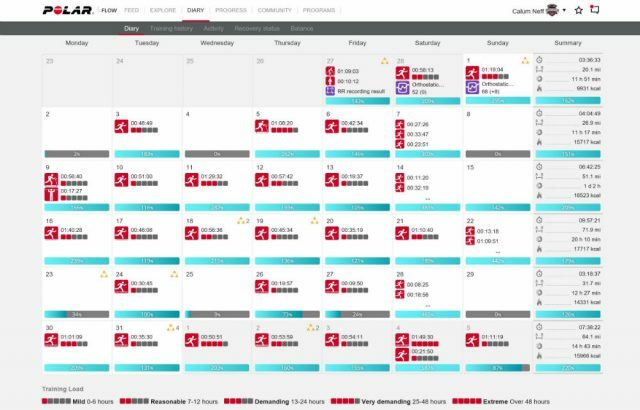 Head to your monthly calendar view of your training diary. Once created it will load to your watch. if you save it to your favorites, it will be available to do any time or day you wish. Now you can select the type of target (in this example, I created an interval target). Get creative! Add your warmup, hard efforts—the length can be either time or distance and the effort can be pace or heart-rate based—recovery, and cool down. Be sure to give your workout a great name and save it to your favorites (available via the star symbol and on your watch (Polar V800, Polar M430, and other compatible models) after syncing. Sometimes seeing progress (or deterioration) from your training is not so obvious. This is where one of my favorite components of Polar Flow can really help. 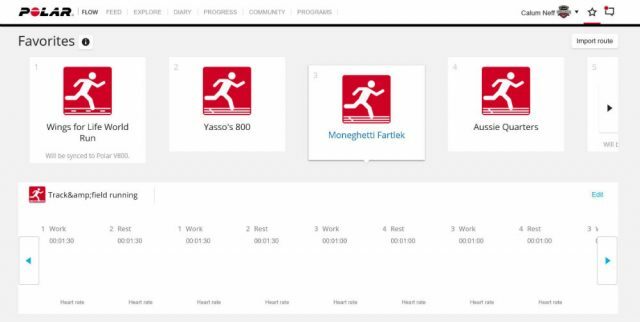 Under the “Progress” tab you can select the “Running Index Report” to get a visual of your long-term training trends. TIP: The more you record heart rate and GPS data with your sessions, the more accurate and useful it becomes. The report will give you estimated race performance predictors from the start and end of the period. It can be a little scary how accurate these are. The running index number is essentially a predicted V02 max value (or if you are using a system like Jack Daniel’s Running Formula, this is your VDOT training value). 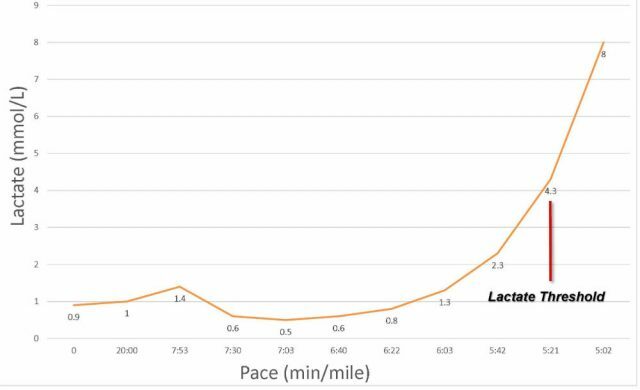 This is useful because now you know what paces to train and race at, saving you a trip (and money) to the lab for V02 and lactate threshold tests. The graph will show you the trend of your fitness. It’s always good to see a 3-month period since just one or a handful of runs are not a good indication of your progression. Hopefully you see that line moving up, and if not, you need to reevaluate your training and ask yourself why you’re not progressing. Even with the automatic uploading of all my watch data to various platforms, I still manually copy over every single detail into my own spreadsheet … some habits are hard to break. I like the format because it’s always handy to me; I don’t need an internet connection, and I don’t have to wait for large files to load with maps and graphs. It’s just the bare numbers, and years and years of it. The main purpose of my log is not just as a diary but also as a plan forward. Once I identify a goal race, I go to that day (row) and enter it in. This is now day zero, and I work backwards from there. I have years of training leading into races that I can reference; using what worked for prior races, I add any necessary tweaks. I know I will do a medium workout 4 days before and a very tough workout 10 days before. In between will be recovery, rest, and mileage days. Before you know it, you have worked your way back 12 weeks, including any buildup races. TIP: 8-12 weeks is a standard training buildup to a key racing event, assuming you already have achieved your base, year-round fitness. One column I watch the most is my rolling 7-day mileage total. I see so many athletes and systems that simply only count weekly mileage from Monday to Sunday. The problem is your weekly mileage on your body is not magically zeroed on Monday. What about your Wednesday-to-Tuesday weekly mileage? This simple rolling total can keep you from exceeding weekly mileage limits and overtraining by ensuring there is enough space between those longer run days. Continuing on from the rolling 7-day average, I will also enter my expected mileage for the week. I play with the numbers to find the safest way to get to my goal for the week without creating any significant jumps, which put you at higher risk for injury. This works the opposite way as well and is a great way to plan your pre-race taper. On the blank columns to the right of my spreadsheet, I will often copy over my old race buildups (simple to merge since you always have the goal race as day zero). This way you can learn from your previous mistakes and do what has worked well in the past. TIP: Sometimes it is helpful to plug in other athletes’ training plans alongside yours for comparative reference. One of the biggest drawbacks of Excel is its inability to handle durations very well. For this reason, I use the formula “=TIME(hh,mm,ss)” for all my run times. I have the formula blank in every cell down the “time” column so it’s ready to fill in. If I put in any run mileage for my forecasting, I leave the time blank and that way I know I haven’t completed that run yet. [=TIME(,,)]. Under Excel’s “Conditional Formatting” tab, you will find the data bars and trending arrows to add to cells, such as your weekly mileage. This makes it quick and easy to see the peaks and valleys of your training load. There are a number of ways to determine your paces and heart rate zones for training and racing, some of which are included in the Polar Flow features (like your Index Report). This will give you a current indication of your fitness level and profile of your recommended training zones. There are even some new noninvasive sensors hitting the market, such as BSX, which can sync to your Polar watch and provide lactate levels in real time. Having one of these tests performed can take a lot of the guesswork out of how fast you should run for a given interval session or upcoming race. “The most import thing to remember as a coach is to ask the why? Why is my recovery taking so long? Why was I slower on that interval? Be curious and always be a student of the sport. As a self-coached runner with most of my runs done solo, sometimes it can be hard to find the motivation to get out there and run—we’ve all experienced those dog-tired days or days where it’s too cold to get out of bed. Social platforms like Strava and Polar Flow Communities can add a social aspect to every run, keep you motivated and honest, and track what other athletes are doing in their training for new inspiration. This is a must-read for all self-coached runners: Calum Neff's top picks for reading material, online resources and recommended workouts. Can your breathing impact your running? Can it improve performance? And if it can what techniques should you employ?